Jodie Satnick hadn't a clue what was in store when she arrived to teach pre-school one early fall morning. 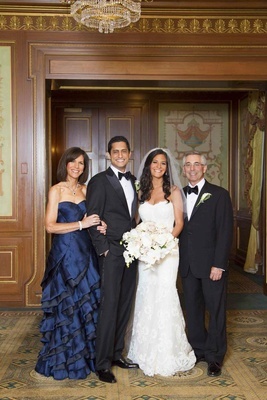 With the blessing of Jodie’s father, Brian Sherman had orchestrated a uniquely sweet proposal that included all of the bride's tiny students. "During rest time, I left the classroom," Jodie says, "and when I came back, Brian had all the kids in a line holding up signs that said 'Jodie, will you marry me?'" Brian himself was on bended knee, and in one hand held a sign with a question mark on it, and in the other, a sparkling engagement ring. "Apparently the rest of the school was in on the secret, too, and had congregated in the classroom!" reveals Jodie, who gave a resounding "yes!" in front of all her delighted witnesses. 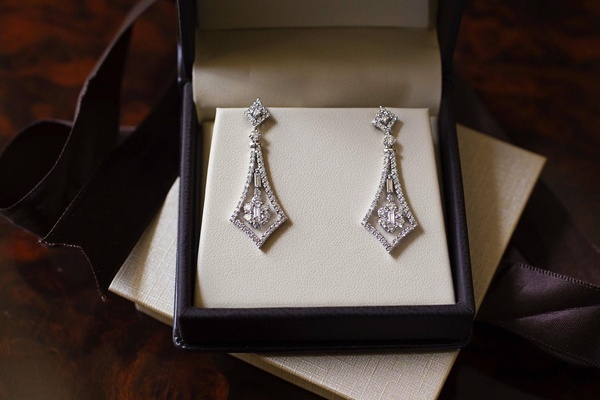 Wedding planning was soon underway, with much help and guidance from the bride's family. "I am the youngest of four kids and we have all gotten married in the past six years," notes Jodie. 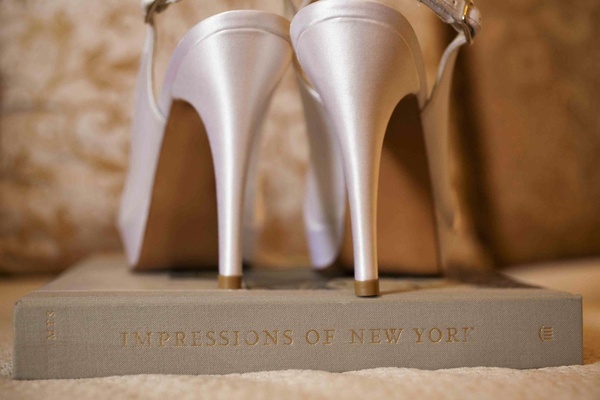 "My parents have pretty much mastered the wedding-planning process," she shares. Adds Brian, "I told her father he needed to dust off the old saddle because we were going to have one more rodeo!" 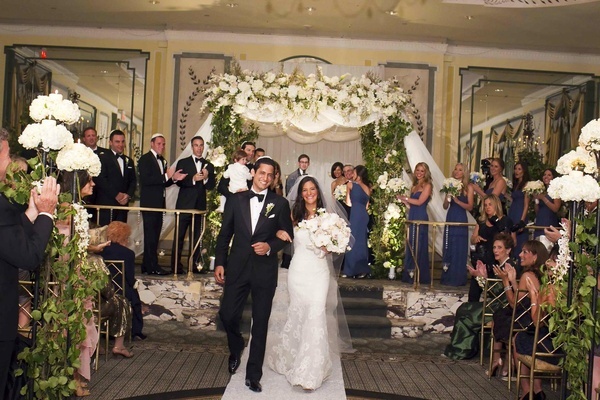 After the couple selected a venue – a posh hotel facing Central Park on Manhattan's famed Fifth Avenue – the rest was easy. "We’d had wonderful experiences with the florist, band, photographer, and videographer two years before at my sister's wedding," says Jodie, "and we knew we wanted to work with them all again." 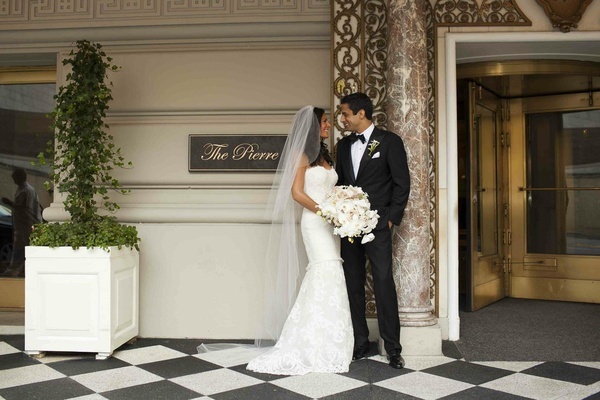 The bride desired décor that felt romantic and flowy, befitting the hotel's 1930s European-inspired style. Therefore, a mélange of whites and creams were utilized. "We didn’t want anything to feel 'set' and serious," explains Jodie. 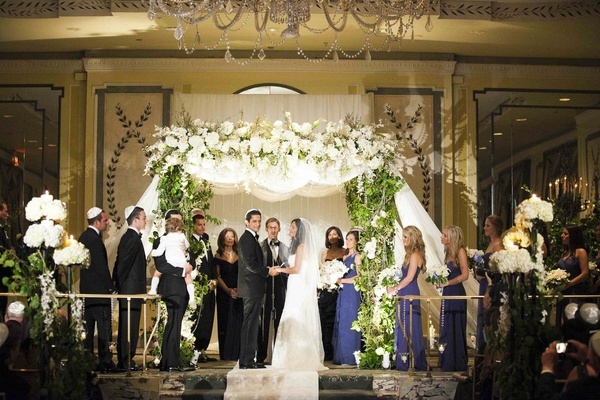 An abundance of candles and cascading flower arrangements were used throughout the ceremony space. 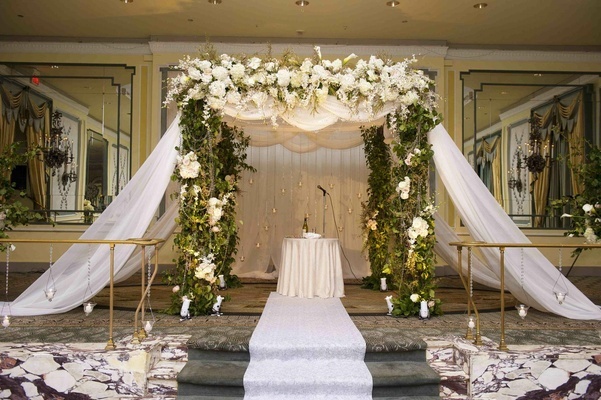 In accordance with Jewish tradition and the bride's wishes for effortless romance, a verdant chuppah was formed using a plethora of white flowers and sheer fabric. 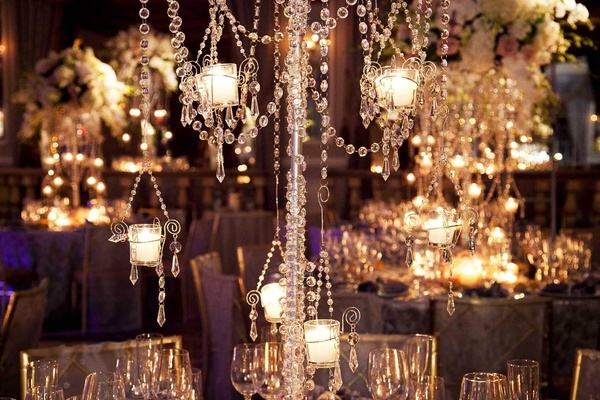 Tealight candles hung from beaded strands, adding a flickering glow to the evening nuptials. 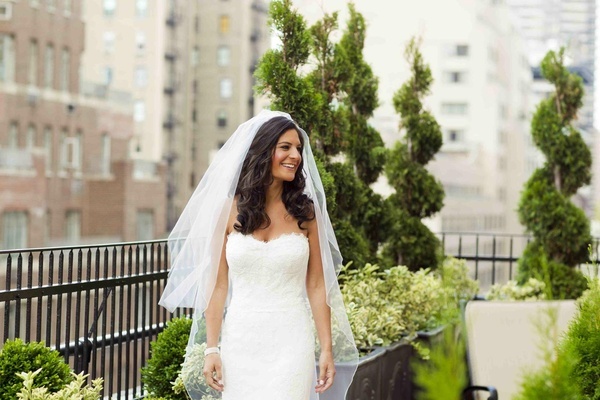 The bride was radiant in a strapless gown of delicate white lace. A romantic floor-length veil framed her face. 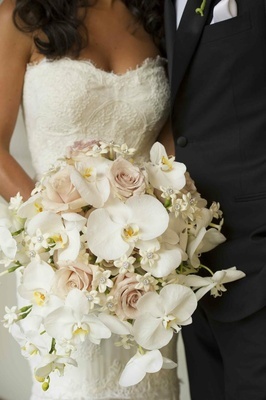 She carried a bouquet of pale pink ‘Quicksand’ roses, white orchids, and jewel-dotted stephanotis blossoms. 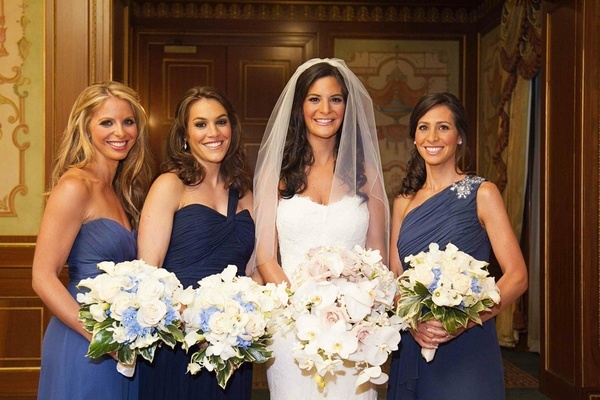 Her bridesmaids were regal in royal blue gowns, each carrying a snowy bouquet accented with indigo blooms. Darling flower girls coordinated perfectly in sleeveless white dresses accented in blue. 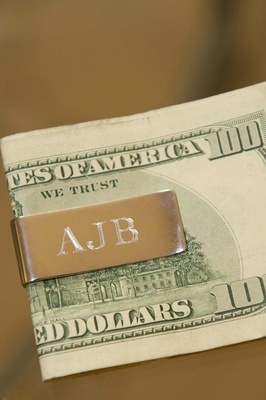 A ring bearer donned an adorable white suit jacket, shorts, and knee-high socks. The groom chose a classic black tux and bow tie, as did his handsome groomsmen. The same rabbi who wed the bride's sister and brother-in-law officiated the union. 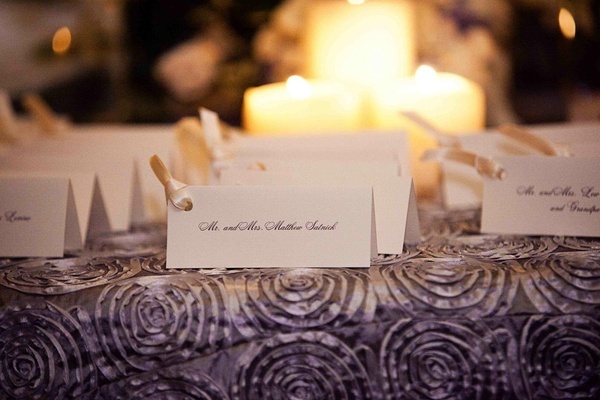 Prior to the ceremony, the rabbi requested that the bride and groom write letters to each other, which Jodie and Brian weren't allowed to share with one another. 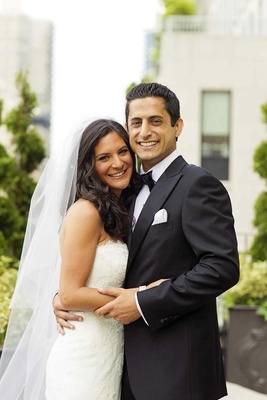 Throughout the nuptials, the rabbi read aloud excerpts from the pages. 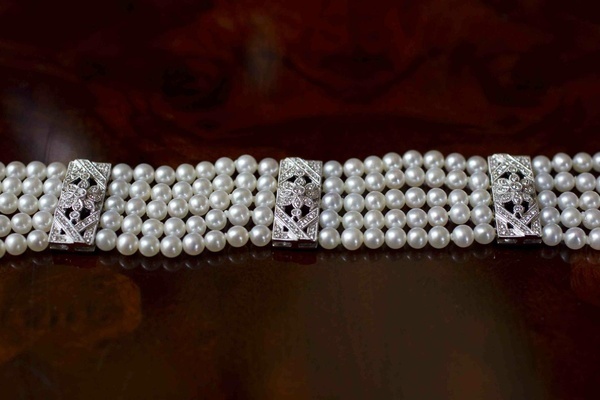 "It was extremely intimate and personal," the couple reminisces. 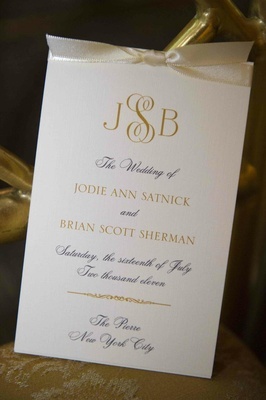 After the "I dos," Jodie and Brian were escorted to a private room where their letters to each other were waiting for them to read. 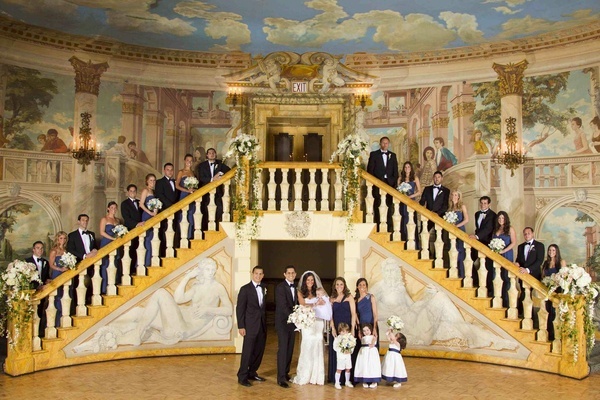 Following the evening ceremony, guests entered a pale blue rotunda where antique scones lit frescoed walls. A round table sat in the middle of the space, holding table cards that formed a circular pattern. 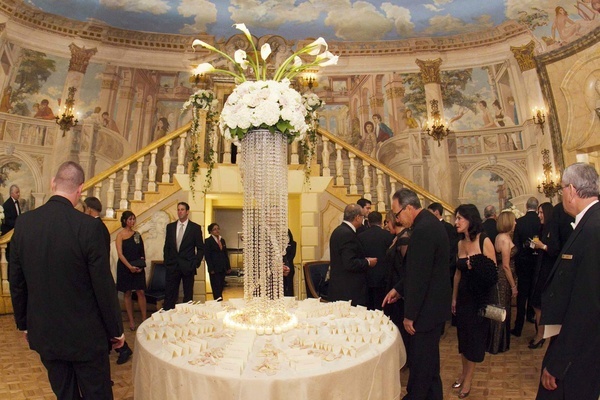 In the center loomed a cluster of white hydrangeas and pale pink roses, calla lilies emerging from the top. Underneath, clear glass beads hung in a spherical formation. At the base, a swirl of candles glowed. 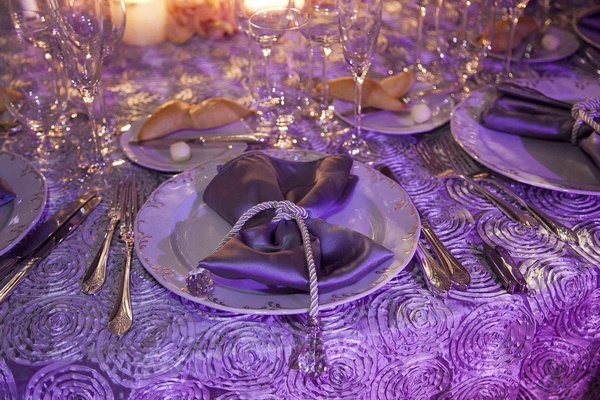 The dining room was set with purple linens atop round tables, creating an intimate vibe. 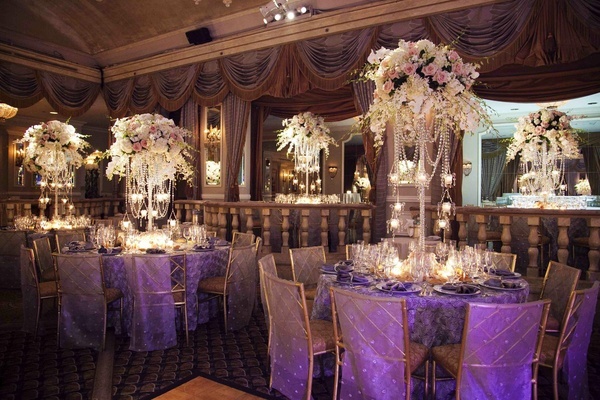 Golden lattice-back chairs were clad in sheer lavender fabric. Table centerpieces were full and cascading. 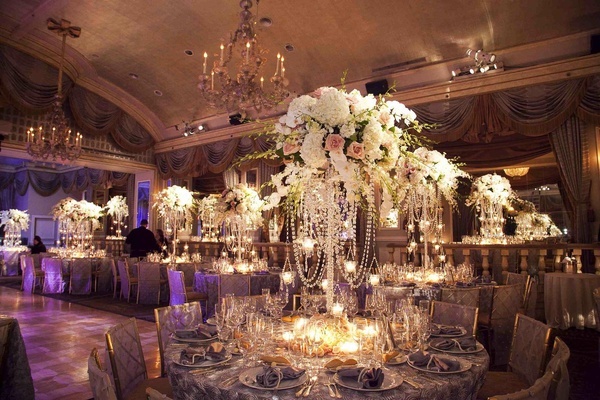 Crystal stands flowed with languorous white phalaenopsis orchids, clusters of beigey-pink roses, green hydrangeas, and long white dendrobium orchids. 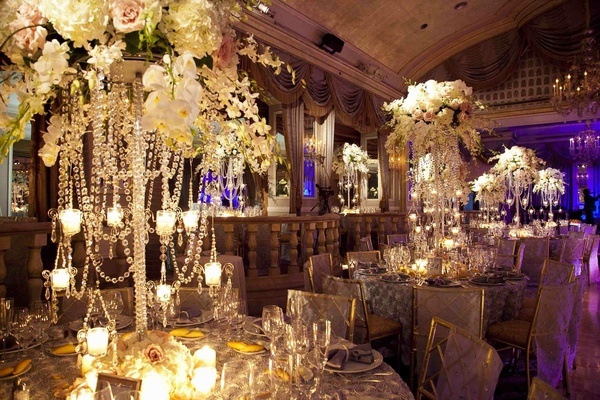 Crystals and candles were mixed in with the flowers to create a romantic cascading effect. 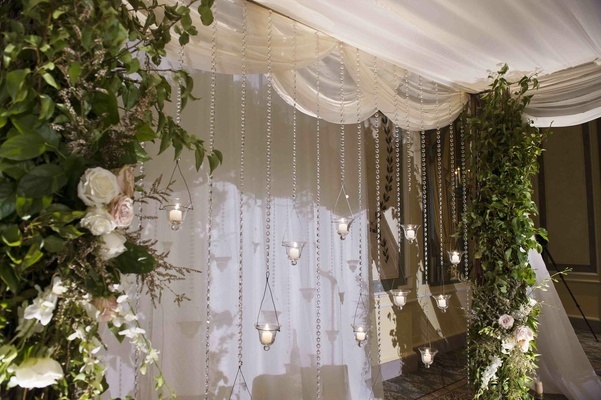 "I really wanted the flow of the night to be soft and natural," notes the bride. While the bride took the reigns on décor, the groom was more than happy to help with food selection. "That process was extremely enjoyable," shares Brian. "We got to try everything the hotel had to offer and it was actually very difficult to narrow down our choices because everything was so delicious," he adds. In the end, guests feasted on main dishes of lamb chops and Dover sole.One of the culinary highlights included a five-tier wedding cake by a renowned baker. 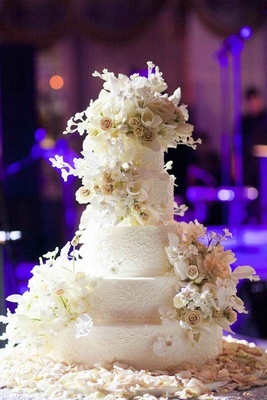 "We described our flower arrangements and she was able to create a masterpiece by covering the whole cake with the same flowers made out of icing," reveals Jodie of the breathtaking floral-patterned confection. Delicate flower petals encircled its base. Guests were also treated to a tequila bar made of ice, which proved very popular. "There were definitely some interesting things going on there all night long," Brian laughs. 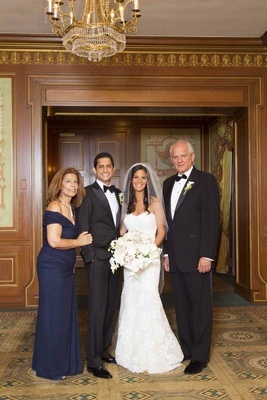 In fact, when asked if there was anything he would change about their big day, he relays, "We probably should not have sat the grandparents and their friends right next to the tequila bar!" The dance floor was full the entire night, which was of great importance to the couple. "I am a firm believer in music setting the tone for the evening," Brian says. 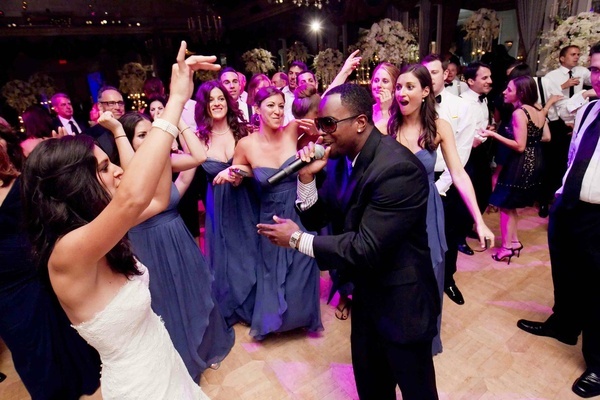 Therefore, the couple selected a variety of music to include a little something for everyone, including a live performance by the guitar-playing groom himself. As the band played AC/DC's "You Shook Me All Night Long," Brian came out and accompanied with them. His bride joined him on stage. "Everyone was singing and dancing along," says the couple of the moment they will never forget. Towards the end of the song, the bride stage-dived into the crowd, followed by her groom. "It was probably the first time someone was able to say they stage dived at The Pierre," laughs Brian. That said, the couple note that the most important aspect of the celebration was that everyone enjoyed themselves. "As much as the night was about us" says Brian, "it was also about our friends and family. 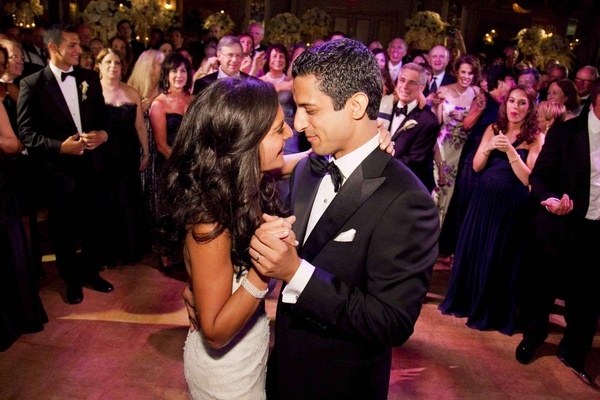 They were ultimately what made the night so amazing and filled the room with so much love and happiness." The Bachelorette's Ashley Hebert & J.P. Rosenbaum Say "I Do"